Power up the Twin Spin rotors of this awesome machine and take to the skies. Lower the winch, hook up the tracked snowcat vehicle and airlift it to its destination. Perform perfect landings on ice and snow with the helicopter's cool skis! The 3-in-1 LEGO® Creator Twin Spin Helicopter features a high-tech design with a light-blue and white color scheme and can be rebuilt to create a snowmobile with functioning winch or a single-engine airplane with spinning propeller. Price is 7% below the initial Lego retail price, a € 2.04 discount! This comes down to 8.57 cent per brick. 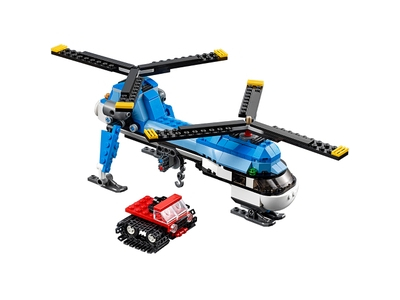 The Twin Spin Helicopter (31049) Lego set is no longer directly available from the sites below. However, 3rd party partners of these sites might still have the set available. Alternate description Airlift the snowcat with the high-tech 3-in-1 Twin Spin Helicopter, featuring Twin Spin rotors and a working winch. Rebuild into a snowmobile or single-engine airplane. Features working Twin Spin rotors, working winch, tinted cockpit, navigation lights, 2 engines, elevated rear landing gear and landing skis. Also includes a tracked snowcat vehicle. Check out the light-blue and white color scheme. Fire up the powerful Twin Spin rotors, winch up the snowcat vehicle and head for higher ground! This set includes over 300 pieces. 3-in-1 model: rebuilds into a snowmobile or single-engine airplane. Twin Spin Helicopter measures over 4” (12cm) high, 13” (33cm) long and 7” (18cm) wide. Snowcat measures over 1” (3cm) high, 3” (10cm) long and 3” (9cm) wide. Snowmobile measures over 2” (6cm) high, 8” (22cm) long and 2” (7cm) wide. Single-engine airplane measures over 3” (8cm) high, 6” (16cm) long and 7” (19cm) wide.